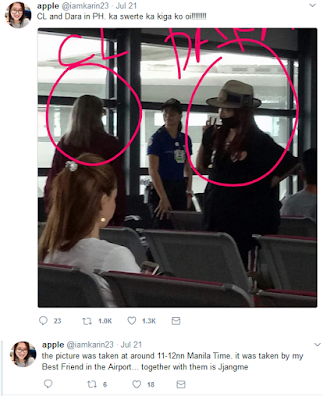 A netizen claimed to have spotted former 2ne1 members Sandara Park and CL at Ninoy Aquino International airport last Saturday, July 22. Twitter user @iamkarin23 posted a photo of the two on her twitter account, saying they are waiting for their flight at the airport. The two were photographed by her bestfriend and were going to Palawan, according to her. Dara was perhaps CL's tour guide on her trip in Palawan and the latter was enjoying it as seen on her recent posts on instagram. It can be recalled that YG entertainment announced the disbandment of the famous Kpop group last November 2016. Since then, the members have been focusing on their solo careers.